Stacy Tilton Reviews: Did somebody say TastyKake? In our house it's become quite the tradition that we pick up the new (or limited time only) TastyKake flavors whenever they hit the shelves. The kids really look forward to it, so much so all I have to do is mention the name TastyKake and my daughter will run in the room and ask "Did somebody say TastyKake?" just to make sure she heard me right. She is in love with their Pumpkin Spice donuts from the fall line so every year she just waits for the moment I let her know they are out. Tastykake's new Pumpkin Spice and Caramel Apple Mini Donuts capture the comforting fall flavors of pumpkin spice and caramel apple in delicious mini donuts. Pumpkin Spice Mini Donuts feature a pumpkin spice donut covered in cinnamon and the Caramel Apple Mini donuts feature apple flavored donuts with a caramel crumble coating. Tastykake's new Apple Cinnamon Sweet Rolls are the perfect new treat for cinnamon lovers everywhere. Apple Cinnamon Sweet Rolls feature a tasty sweet rolls with a mouth-watering apple cinnamon filling. Tastykake's tasty twists on its proprietary Kandy Kake treats provide an autumn-inspired snack cake to welcome the changing season. Tastykake's Salted Carmel Kandy Kakes feature a chocolate coated cake with salted caramel filling. The new Tastykake Kake Chips I recently received were just as big of a hit as their fall line in my house. Well...maybe an even bigger hit - they barely lasted a week. I think every time I walked into the kitchen I saw my son with his hand in the cookie bag. I will have to agree though they are pretty darn tasty. I love the combination of the sweet cookie flavor with the crunch of a chip. They make a great anytime snack that's one thing for sure! 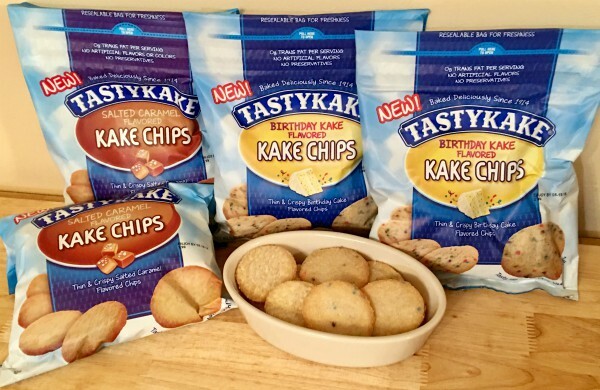 Tastykake's new product, Kake Chips combine the crunch of a chip with the sweetness of cake, and are the ideal balance of sweet and satisfying. Available in two delectable flavors, Salted Caramel and Birthday Kake, they're made deliciously with zero grams of trans fat per serving and no artificial flavors or preservatives. Kake Chips also come in convenient, resealable bags to ensure the last Kake Chip is just as delicious as the first.